Andi Peterson of Archbold pulls up for a basket in a game against Evergreen last season. She returns as one of the Blue Streaks better players in 2018-19. 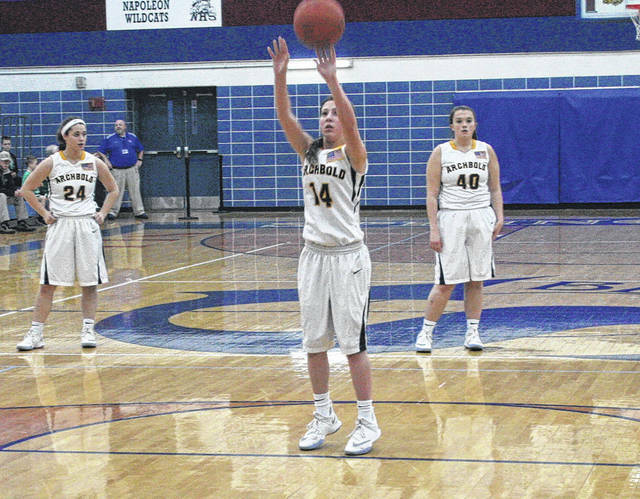 Gabby Nafziger of Archbold hits a free throw during a game last season. She returns for the Blue Streaks. 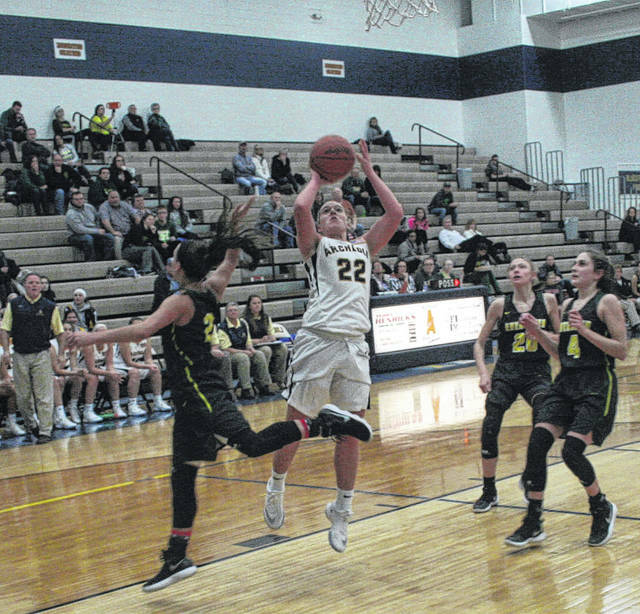 If Archbold can fight through the injury bug, they should be a major factor in the Northwest Ohio Athletic League girls basketball title chase this season. Back for the Blue Streaks are Andi Peterson (second team All-NWOAL, first team District 7, honorable mention all-district), Lily Krieger (second team All-NWOAL, honorable mention District 7), Gabby Nafiziger, Faith Wyse, Sophie Hubby, Naomi Rodriguez and Kayla Boettger. They have a pair of leading scorers back in Krieger and Andi Peterson, no doubt a strength of the team according to Ziegler. Krieger averaged 9.5 points and 6.8 rebounds per game a season ago, while Andi Peterson averaged 9.1 points and 4.8 rebounds. Newcomers to the squad are Hadley Galvan, Kylie Sauder, Addison Moyer and Harley Phillips. However, they will miss Kamryn Hostetler who was first team All-NWOAL, first team District 7, second team All-Northwest District and honorable mention All-Ohio in 2017-18. She notched nearly 13 (12.8) points per game last season. Emie Peterson, who was honorable mention All-NWOAL and in District 7, also departs for the Streaks. Last season, the Streaks dropped a winner-take-all game at Delta for the league title. But, they turned around and defeated the Panthers by 17 in the district final. It should be a competitive fight for the league crown.